The historic Echo Park lake underwent a two-year renovation before it once again became the ultimate family-friendly destination. Walking along the path or enjoying a picnic on the grass costs nothing. 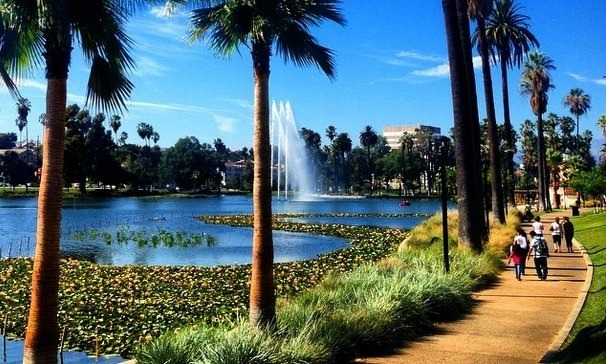 Echo Park Lake is the perfect meeting place for a leisurely stroll, some fishing, or relaxation. Head over from April to August, and you’ll see dozens of lotus pads, frogs, and turtles. With beautiful views, spraying fountains, free WiFi, and well-maintained grounds, this is the ideal place to take a breather. Additionally, many events are hosted here (including Machine Project events, mentioned later in this article). Check out the park website to learn more about current events in advance. 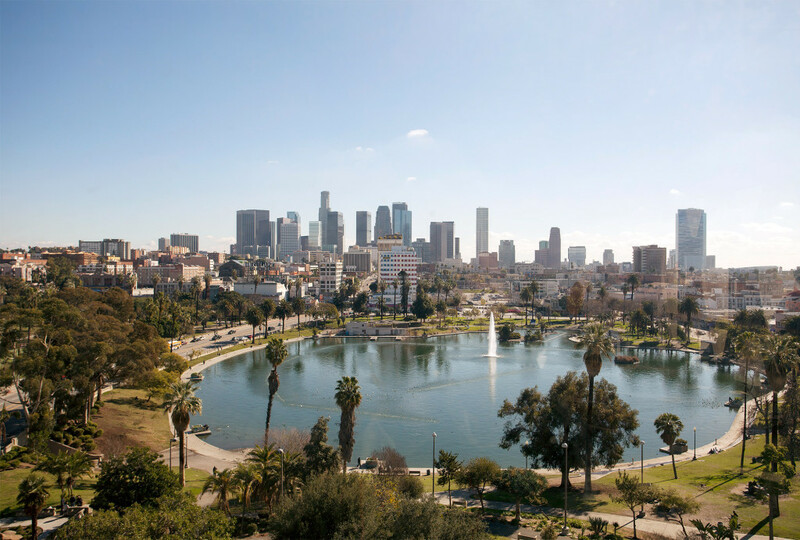 Echo Park is a diverse neighborhood with art as an integral part of its foundation. In fact, from the minute you get to Echo Park, you’re greeted by a giant wall mural on the corner of Sunset Boulevard and Echo Park. With that being said, there are plenty of art galleries to suit your desire. Go on a gallery crawl to get a curated look into the multicultural minds of local artists and designers. Subliminal Projects and iam8bit are two Echo Park galleries worth checking out. Subliminal Projects is owned and operated by Shepard Fairey, the artist and founder of popular clothing line OBEY, as well as the creative mind behind Obama’s renowned “HOPE” campaign photo. The gallery displays work from local artists, including street art. Iam8bit, on the other hand, hosts pop culture-inspired installations and their receptions are grand affairs with free drinks. For book enthusiasts, attending a literary event (for free) is the perfect activity. The Stories Books & Cafe is an Echo Park staple with an outdoor patio and rows of new and used books. Fortunately, many Echo Park bookstores, including Stories, hosts literary events at no cost for attendees. In addition to literary events, the book shop also hosts comedy shows and movie nights for free, with drinks and food available for purchase. In fact, if you bring in your old books, you may even make money from your visit. Use it to buy a nice cup of fair trade coffee from the cafe. Whether you’re an architecture enthusiast or simply appreciate a good home, there’s nothing like a stroll through Angelino Heights — especially on a nice day. The neighborhood, particularly Carroll Avenue (in 1976, the street was added to the National Register of Historic Places), is lined with historic Victorian homes. 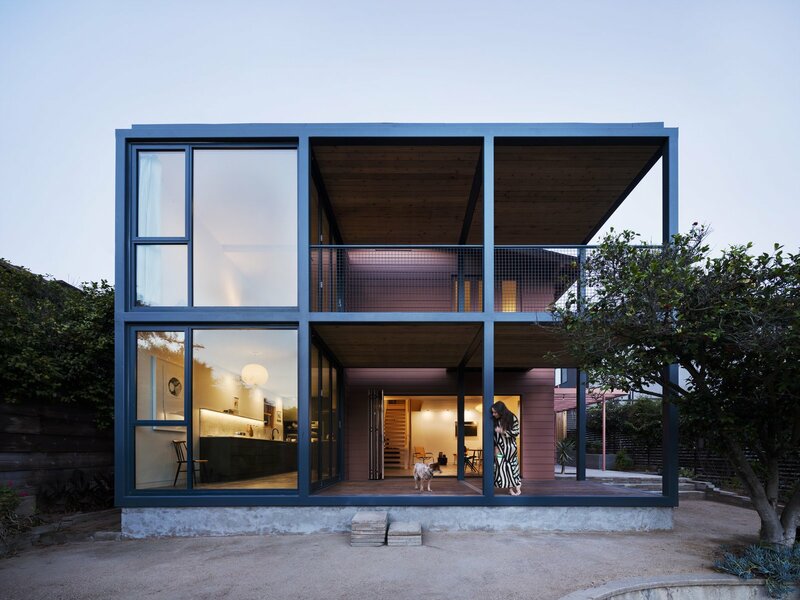 Nearly all of these grandiose homes have been remodeled, and they make up Los Angeles’ first ever suburban neighborhood. Several of these homes are a part of the Los Angeles Historic-Cultural Monuments. If you’ve never been here before, but feel like you have, there’s probably a reason for that. This area also served as a backdrop for Michael Jackson’s Thriller, the Charmed television series, and the Fast and the Furious films. While you can take a walk through the area on your own, there’s a walking tour available for a small fee. There are 33 different stairways in Echo Park (some that were built before the commercialization of vehicles), each set winding its way through various neighborhoods and points of interest. But none offers a better view or more thorough exercise than the Baxter Street Stairs. With 231 steps and 180-foot vertical incline, you’re greeted with a phenomenal panorama of Echo Park’s northern hills, Downtown LA, the Hollywood sign, and the Griffith Park observatory. 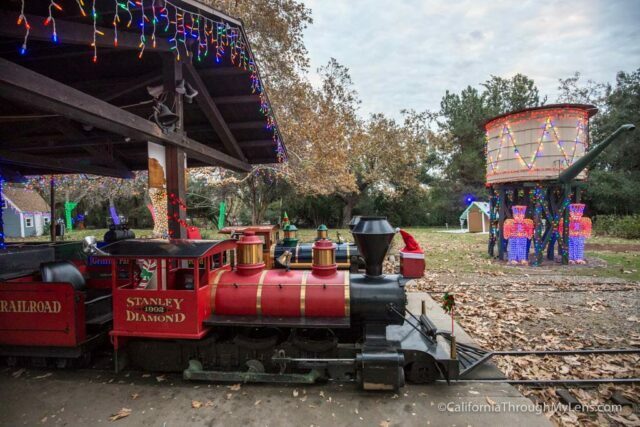 Nature lover’s will rejoice at all the green here at Southern California’s first and first and oldest arboretum. The Chavez Ravine Arboretum in Elysian Park is home to more than 100 different varieties of trees from around the world. From the late 1800s to the early 1940s, horticulturists everywhere donated species to this space. A few of the trees here are the oldest or largest of their kind in the entire country. In addition to free admission (it’s a part of the park) and a variety of trees, you’ll also see a variety of birds, ranging from woodpeckers to ravens and hummingbirds. According to their website, “Machine Project is a place for artists to do fun experiments, together with the public, in ways that influence culture.” It achieves this through a series of events, installations, and workshops. Many of Machine Project’s events are free to attend, with suggested donations advertised. Check out their website for current event listings, or browse previous events to get a feel for what Machine Project does. Los Angeles is a mecca for contemporary art, including a vibrant culture of collaborative and public art projects. The city is filled with dynamic murals painted by local artists, and the Echo Park and Silver Lake areas are no exception. Today, we’ll show you the larger-than-life denizens of Animal Alley, a collaborative mural gallery in the Echo Park neighborhood. Looking for more Echo Park public art? Check out our post about the Lady of the Lake! Animal Alley is the brainchild of Los Angeles gallery owner Jason Ostro. He showcases emerging artists at Gabba Gallery, a boutique exhibition space Echo Park. His Gabba Gallery project began in 2014 as a constructive way to combat the prevalent graffiti and blight in the neighborhood. The initiative inspired local artists to begin decorating local alleys and side streets with imaginative artwork, on themes ranging from typewriters to superheroes to outer space. Ostro kicked off the project with his own mural, a collaboration with local street artist Andrea LaHue, aka “Random Act.” Now, the Gabba Alley project incorporates over a hundred murals by more than eighty-five local and international artists. A prolific local talent whose compositions focus on botanical themes, “Random Act” has contributed her signature orchids to the Animal Alley murals. The artwork is focused in four alleys, three near Gabba Gallery and a “satellite street gallery” in Echo Park. “Animal Alley” takes its theme from the wild kingdom, and artists creating individual works for its walls are invited to base their artworks on the creatures of their choice. “Animal Alley L.A.” can be found off Glendale Boulevard, just behind the Bob Baker Marionette Theater. Entries range from growling cheetahs to marching elephants to winged kittens – and since the Alley Project is eclectic by design, artists have created murals in a range of styles from figurative to realistic. Many painters have expanded on the animal theme by adding lush vegetation, including vines, ferns, and colorful flowers. Looking for more local color? Read our post on the history of Echo Park’s Carroll Avenue! Ostro works with local residents and business owners to locate wall space, and most of the materials used to create the murals are donated. A few artists have contributed sculptures and art installations made from recycled materials, including a royal macaw made out of scrap metal from used coffee tins. National art supply chain Blick has been a proud sponsor of the Gabba Alley Project from the outset. Animal Alley, like the other streets in the Gabba Alley Project, is designed to encourage neighborhood participation, so the project will be ongoing and may eventually expand into nearby side streets and wall spaces. Current murals occupy open walls, garage doors, and even dumpsters. Painting sessions tend to be half open studio, half block party, with troupes of artists showing up to work together on outsize compositions. Animal Alley’s finished works already include fifteen bright animal-themed paintings, and the menagerie has already become a stop on several city art tours. If you’re planning to visit Echo Park, why not make a stop in Animal Alley? You can see local creativity and civic pride on display, and you might even catch local artists hard at work on a mural in progress! Looking for places to eat during your visit? Read our guide to the best restaurants in Echo Park!